Mr. Johnson has over 25 years experience successfully managing research projects related to the environmental effects of hydroelectric energy production. Mr. Johnson was the technical manager for hydroacoustic monitoring and evaluation studies during the development of the surface flow bypass system at the Wells Dam from 1983 – 1992, which is arguably the most efficient smolt bypass in the Columbia basin. He served as manager of the Technical Services Division at BioSonics, Inc. before moving to the Bonneville Power Administration as a fisheries biologist. At BPA, Mr. Johnson worked to integrate needs for safe fish passage with the demand for hydroelectric generation. This led to Mr. Johnson being hired at PNNL to manage fish passage evaluations and bioengineering projects on the Snake River. He continued this type of work for BioAnalysts, Inc. before returning to PNNL to work on estuarine studies. 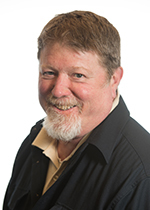 Mr. Johnson currently manages projects related to research, monitoring, and evaluation in the lower Columbia River and estuary. 2010 Outstanding Performance Award for unparalleled levels of teamwork within various PNNL organizations - attention to detail and safety. Johnson G.E. 2015. Facilitation of the Estuary/Ocean Subgroup and the Expert Regional Technical Group, Annual Report for 2015. PNNL-24623. Richland, WA: Pacific Northwest National Laboratory. Johnson G.E. 2014. Facilitation of the Estuary/Ocean Subgroup and the Expert Regional Technical Group, Fiscal Year 2014 Annual Report. PNNL-23603. Richland, WA: Pacific Northwest National Laboratory. Johnson G.E., and N.K. Sather. 2013. Facilitation of the Estuary/Ocean Subgroup and the Expert Regional Technical Group, Fiscal Year 2013 Annual Report. PNNL-22757. Richland, WA: Pacific Northwest National Laboratory. Johnson G.E., N.K. Sather, A. Storch, J. Johnson, J.R. Skalski, D.J. Teel, and T. Brewer, et al. 2013. Multi-Scale Action Effectiveness Research in the Lower Columbia River and Estuary, 2012. PNNL-22481. Richland, WA: Pacific Northwest National Laboratory. Skalski J.R., R.L. Townsend, A. Seaburg, G.R. Ploskey, M.A. Weiland, J.S. Hughes, and C.M. Woodley, et al. 2013. Compliance Monitoring of Subyearling Chinook Salmon Survival and Passage at The Dalles Dam, Summer 2012. PNNL-22195. Richland, WA: Pacific Northwest National Laboratory. Johnson G.E., and W.S. Rainey. 2012. "Eco-Design of River Fishways for Upstream Passage: Application for Hanfeng Dam, Pengxi River, China." Journal of Chongqing Normal University - Natural Science Edition 29, no. 3:104-113. PNNL-SA-85479. Johnson G.E., M.J. Hennen, S.A. Zimmerman, G. Batten, S.M. Carpenter, Z. Deng, and T. Fu, et al. 2012. Survival and Passage of Yearling Chinook Salmon and Steelhead at The Dalles Dam, Spring 2011 - FINAL REPORT. PNNL-21826. Richland, WA: Pacific Northwest National Laboratory. Khan F., I.M. Royer, G.E. Johnson, and K.D. Ham. 2012. Hydroacoustic Evaluation of Juvenile Salmonid Passage and Distribution at Detroit Dam, 2011. PNNL-21577 FINAL. Richland, WA: Pacific Northwest National Laboratory. Sather N.K., A. Storch, G.E. Johnson, D.J. Teel, J.R. Skalski, A.J. Bryson, and R.M. Kaufmann, et al. 2012. Multi-Scale Action Effectiveness Research in the Lower Columbia River and Estuary, 2011 - FINAL ANNUAL REPORT. PNNL-21194 FINAL. Richland, WA: Pacific Northwest National Laboratory. Skalski J.R., R.L. Townsend, A. Seaburg, G.E. Johnson, G.R. Ploskey, and T.J. Carlson. 2012. Compliance Monitoring of Juvenile Yearling Chinook Salmon and Steelhead Survival and Passage at The Dales Dam, Spring 2011. PNNL-21124. Richland, WA: Pacific Northwest National Laboratory. Skalski J.R., R.L. Townsend, A. Seaburg, G.E. Johnson, G.R. Ploskey, and T.J. Carlson. 2012. Compliance Monitoring of Juvenile Yearling Chinook Salmon and Steelhead Survival and Passage at The Dalles Dam, Spring 2011. PNNL-21124 Rev 1. Richland, WA: Pacific Northwest National Laboratory. Carlson T.J., G.E. Johnson, C.M. Woodley, J.R. Skalski, and A. Seaburg. 2011. Compliance Monitoring of Underwater Blasting for Rock Removal at Warrior Point, Columbia River Channel Improvement Project, 2009/2010. PNNL-20388. Richland, WA: Pacific Northwest National Laboratory. Johnson G.E., A. Storch, J.R. Skalski, A.J. Bryson, C. Mallette, A.B. Borde, and E. Van Dyke, et al. 2011. Ecology of Juvenile Salmon in Shallow Tidal Freshwater Habitats of the Lower Columbia River, 2007-2010. PNNL-20083. Richland, WA: Pacific Northwest National Laboratory. Carlson T.J., and G.E. Johnson. 2010. Columbia River Channel Improvement Project Rock Removal Blasting: Monitoring Plan. PNNL-19076. Richland, WA: Pacific Northwest National Laboratory. Deng Z., R.P. Mueller, M.C. Richmond, and G.E. Johnson. 2010. "Injury and mortality of juvenile salmon entrained in a submerged jet entering still water." North American Journal of Fisheries Management 30, no. 3:623-628. PNNL-SA-63135. Johnson G.E. 2010. Facilitation of the Estuary/Ocean Subgroup for Federal Research, Monitoring, and Evaluation, FY10 Annual Report. PNNL-19940. Richland, WA: Pacific Northwest National Laboratory. Johnson G.E., T.J. Carlson, and J.R. Skalski. 2010. Compliance Monitoring of Juvenile Subyearling Chinook Salmon Survival and Passage at The Dalles Dam, Summer 2010. PNNL-20042. Richland, WA: Pacific Northwest National Laboratory. Khan F., G.E. Johnson, and M.A. Weiland. 2010. Hydroacoustic Evaluation of Overwintering Summer Steelhead Fallback and Kelt Passage at The Dalles Dam, 2009-2010. PNNL-19615. Richland, WA: Pacific Northwest National Laboratory. Johnson G.E. 2009. Facilitation of the Estuary/Ocean Subgroup for Federal Research, Monitoring, and Evaluation, FY09 Annual Report. PNNL-18907. Richland, WA: Pacific Northwest National Laboratory. Johnson G.E., M.C. Richmond, J.B. Hedgepeth, G.R. Ploskey, M.G. Anderson, Z. Deng, and F. Khan, et al. 2009. Smolt Responses to Hydrodynamic Conditions in Forebay Flow Nets of Surface Flow Outlets, 2007. PNNL-17387. Richland, WA: Pacific Northwest National Laboratory. Khan F., G.E. Johnson, and M.A. Weiland. 2009. Hydroacoustic Evaluation of Overwintering Summer Steelhead Fallback and Kelt Passage at The Dalles Dam 2008-2009. PNNL-18590. Richland, WA: Pacific Northwest National Laboratory. Ploskey G.R., M.A. Weiland, D.M. Faber, Z. Deng, G.E. Johnson, J.S. Hughes, and S.A. Zimmerman, et al. 2009. Survival Rates of Juvenile Salmonids Passing Through the Bonneville Dam and Spillway in 2008. PNNL-18748. Richland, WA: Pacific Northwest National Laboratory. Sather N.K., G.E. Johnson, A. Storch, D. Teel, J.R. Skalski, T.A. Jones, and E.M. Dawley, et al. 2009. Ecology of Juvenile Salmon in Shallow Tidal Freshwater Habitats in the Vicinity of the Sandy River Delta, Lower Columbia River, 2008. PNNL-18450. Richland, WA: Pacific Northwest National Laboratory. Weiland M.A., G.R. Ploskey, J.S. Hughes, Z. Deng, T. Fu, T.J. Monter, and G.E. Johnson, et al. 2009. Acoustic Telemetry Evaluation of Juvenile Salmonid Passage and Survival at John Day Dam with Emphasis on the Prototype Surface Flow Outlet, 2008. PNNL-18890. Richland, WA: Pacific Northwest National Laboratory. Weiland M.A., J. Kim, W.T. Nagy, and G.E. Johnson. 2009. Evaluation of Steelhead Kelt Passage into the Bonneville Dam Second Powerhouse Corner Collector Prior to the Juvenile Migration Seasons, 2007 and 2008. PNNL-18323. Richland, WA: Pacific Northwest National Laboratory. Johnson G.E., and G.B. Sutherland. 2008. Proceedings of the Columbia River Estuary Conference on Ecosystem Restoration. Richland, Washington:Battelle Press. PNNL-SA-61338. Johnson G.E., B. Ebberts, A.E. Giorgi, K. Kuhn, R. Lee, J.H. Plump, and D.A. Stensby, et al. 2008. "Outfall Site and Type Selection for a New Surface Flow Outlet to Pass Juvenile Fish at Bonneville Dam's Second Powerhouse, Columbia River." In Proceedings of the 4th American Fisheries Society Symposium: Fisheries Bioengineering, edited by SV Amaral, D Mathur, EP Taft, 203-216. Bethesda, Maryland:American Fisheries Society. PNNL-SA-42302. Johnson G.E., B.D. Ebberts, A.E. Giorgi, K. Kuhn, R.T. Lee, J.H. Plump, and D.A. Stensby, et al. 2008. "Outfall Site and Type Selection for a New Surface Flow Outlet to Pass Juvenile Salmonids at Bonneville Dam's Second Powerhouse, Columbia River." In Advances in Fisheries Bioengineering: 4th Fisheries Bioengineering Symposium, Bethesda, Maryland, edited by SV Amaral, D Mathur, EP Taft, 203-216. Bethesda, Maryland:American Fisheries Society. PNNL-SA-53930. Johnson G.E., G.R. Ploskey, J. Hedgepeth, F. Khan, R.P. Mueller, W.T. Nagy, and M.C. Richmond, et al. 2008. "Reducing the Impacts of Hydroelectric Dams on Juvenile Anadromous Fishes: Bioengineering Evaluations Using Acoustic Imaging in the Columbia River, USA." In Dams: Impacts, Stability and Design, edited by WP Hayes & MC Barnes. 1-48. Hauppauge, New York:Nova Science Publishers. PNNL-SA-61525. Ploskey G.R., J.S. Hughes, F. Khan, J. Kim, B.L. Lamarche, G.E. Johnson, and E.Y. Choi, et al. 2008. Optimization of Concurrent Deployments of the Juvenile Salmon Acoustic Telemetry System and Other Hydroacoustic Equipment at John Day Dam. PNNL-17837. Richland, WA: Pacific Northwest National Laboratory. Sobocinski K.L., G.E. Johnson, N.K. Sather, A. Storch, T.A. Jones, C. Mallette, and E.M. Dawley, et al. 2008. Ecology of Juvenile Salmonids in Shallow Tidal Freshwater Habitats in the Vicinity of the Sandy River Delta, Lower Columbia River, 2007. PNNL-17395. Richland, WA: Pacific Northwest National Laboratory. Duberstein C.A., K.D. Ham, D.D. Dauble, and G.E. Johnson. 2007. The Independent Technical Analysis Process. PNNL-16507. Richland, WA: Pacific Northwest National Laboratory. Johnson G.E., F. Khan, J.R. Skalski, C.L. Rakowski, M.C. Richmond, and J.A. Serkowski. 2007. Hydroacoustic Evaluation of Juvenile Salmonid Passage at The Dalles Dam Spillway, 2006. PNNL-16458. Richland, WA: Pacific Northwest National Laboratory. Johnson G.E., J.W. Beeman, I. Duran, and A. Puls. 2007. Synthesis of Juvenile Salmonid Passage Studies at The Dalles Dam, Volume II, 2001-05. PNNL-16443. Richland, WA: Pacific Northwest National Laboratory. Johnson G.E. 2006. Facilitation of the Estuary/Ocean Subgroup for Research, Monitoring, and Evaluation, FY06 Annual Report. PNNL-16142. Richland, WA: Pacific Northwest National Laboratory. Johnson G.E., and D.D. Dauble. 2006. "Surface Flow Outlets to Protect Juvenile Salmonids Passing through Hydropower Dams." Reviews in Fisheries Science 14, no. 3:213-244. PNNL-SA-50342. Johnson G.E., F. Khan, J. Hedgepeth, R.P. Mueller, C.L. Rakowski, M.C. Richmond, and J.A. Serkowski, et al. 2006. Hydroacoustic Evaluation of Juvenile Salmonid Passage at The Dalles Dam Sluiceway, 2005. PNNL-15540. Richland, WA: Pacific Northwest National Laboratory. Pearson W.H., J.R. Skalski, K.L. Sobocinski, M.C. Miller, G.E. Johnson, G.D. Williams, and J.A. Southard, et al. 2006. A Study of Stranding of Juvenile Salmon by Ship Wakes Along the Lower Columbia River Using a Before-and-After Design: Before-Phase Results. PNNL-15400. Richland, WA: Pacific Northwest National Laboratory. Ploskey G.R., G.E. Johnson, M.A. Weiland, F. Khan, R.P. Mueller, J.A. Serkowski, and C.L. Rakowski, et al. 2006. "Acoustic Camera Evaluation of Juvenile Salmonid Approach and Fate at Surface Flow Outlets of Two Hydropower Dams." In HydroVision 2006, 13 pages. Kansas City, Missouri:HCI Publications. PNNL-SA-48572. Johnson G.E., M.E. Hanks, F. Khan, C.B. Cook, J. Hedgepeth, R.P. Mueller, and C.L. Rakowski, et al. 2005. Hydroacoustic Evaluation of Juvenile Salmonid Passage at The Dalles Dam in 2004. PNNL-15180. Richland, WA: Pacific Northwest National Laboratory. Johnson G.E., S.M. Anglea, N.S. Adams, and T.O. Wik. 2005. "Evaluation of a prototype surface flow bypass for juvenile salmon and steelhead at the powerhouse of Lower Granite Dam, Snake River, Washington, 1996-2000." Fisheries 25, no. 1:138-151. PNWD-SA-5764. Ploskey G.R., G.E. Johnson, A.E. Giorgi, R.L. Johnson, J.R. Stevenson, C.R. Schilt, and P.N. Johnson, et al. 2005. Synthesis of Biological Reports on Juvenile Fish Passage and Survival at Bonneville Dam through 2005. PNNL-15041. Richland, WA: Pacific Northwest National Laboratory. Rakowski C.L., M.C. Richmond, J.A. Serkowski, and G.E. Johnson. 2005. Forebay Computational Fluid Dynamics Modeling for The Dalles Dam to Support Behavior Guidance System Siting Studies. PNNL-15689. Richland, WA: Pacific Northwest National Laboratory. Johnson G.E., J. Hedgepeth, J.R. Skalski, and A.E. Giorgi. 2004. "A Markov Chain Analysis of Fish Movements to Determine Entrainment Zones." Fisheries Research 69, no. 3:349-358. PNWD-SA-6170. Johnson G.E., J. Hedgepeth, J.R. Skalski, and A.E. Giorgi. 2004. "A Markov chain analysis of fish movements to determine entrainment zones." Fisheries Research 69, no. 3:349-358. PNNL-SA-36658. Hedgepeth J., G.E. Johnson, J.R. Skalski, and J. Burczynski. 2002. "Active Fish Tracking Sonar (AFTS) for Assessing Fish Behaviour." In European Conference on Underwater Acoustics, published in "Acta Acustica United with Acustica", 88, 739-742. Stuttgart:S. Hirzel Verlag. PNWD-SA-5739. Adams N., G.E. Johnson, D.W. Rondorf, S.M. Anglea, and T.O. Wik. 2001. "Biological Evaluation of the Behavioral Guidance Structure at Lower Granite Dam on the Snake River, Washington in 1998." In Behavioral Technologies for Fish Guidance, American Fisheries Society Symposium, 26, 145-160. Bethesda, Maryland:American Fisheries Society. PNWD-SA-5614. Johnson G.E., N.S. Adams, R.L. Johnson, D.W. Rondorf, D.D. Dauble, and T.Y. Barila. 2000. "Evaluation of the Prototype Surface Bypass for Salmonid Smolts in Spring 1996 and 1997 at Lower Granite Dam on the Snake River, Washington." Transactions of the American Fisheries Society 129, no. 2:381-397. PNWD-SA-5610. Johnson R.L., and G.E. Johnson. 2000. "Fish Behavior Relative to a Prototype Surface Bypass and Collector (SBC) at Lower Granite Dam Using Innovative Hydroacoustic Techniques." In Advances in Fish Passage Technology, edited by Mufeed Odeh, 57-67. Bethesda, Maryland:American Fisheries Society. PNWD-SA-4665. Johnson R.L., D.S. Daly, and G.E. Johnson. 1998. "Combining Hydroacoustics, Flow Models to Study Fish Behavior." Hydro Review XVII, no. 7:40-56. PNWD-SA-4485.